In true Bank Holiday Monday spirit we took a trip to the wonderful building that is the British Library yesterday to visit the must see Magnificent Maps exhibition they have showing there until the 19th September. I was thoroughly taken aback over the massive scale of the maps on display and amazed at how much intricate detail they held, all in all the day left me feeling cultured and a little light headed from the shear concentration it took to peruse all the contents of each map. I would definitely recommend a lengthy visit to this exhibition as it will take you a fair bit of time to look through them all but it is well worth it, plus it is free to go and see! 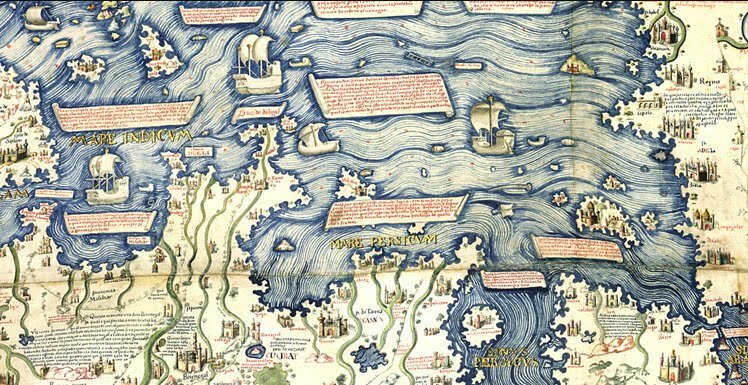 Some of my favorites of the day were the more decorative and lavishly painted maps with stunning colours which had sea lines that reminded me of wood carvings. 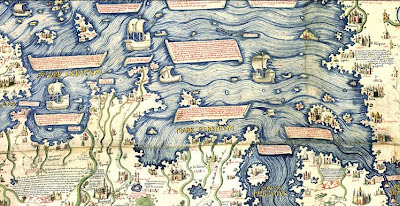 Also we did have some great fun trying to spot the eccentric sea monsters which feature in most of the earlier maps, now these were probably what the explorers thought they saw at the time when really they were probably just dolphins or whales! 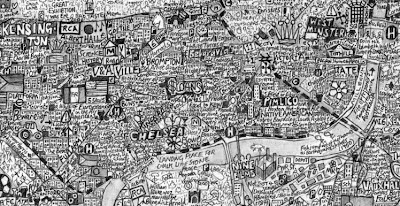 Some of the later maps in the last rooms brought on big crowds, like 'The Island' (below) by Stephen Walter 2008 which expresses quite a comedic view of London by altering the names of places with regards to how he and the average Londoner lives everyday life. So if you have a spare morning or afternoon why not go and see this exhibition for yourself and marvel at 80 of the most impressive maps dating back from 200 AD up to the present day. The gift shop is full of great treats too, but unfortunately for us I think we missed a SewSmitten opportunity there by not contacting them sooner as I think they would have loved to stock some of our London Map Oyster cardholders there too!